Ships tomorrow if you order in the next 22 hours 50 minutes. 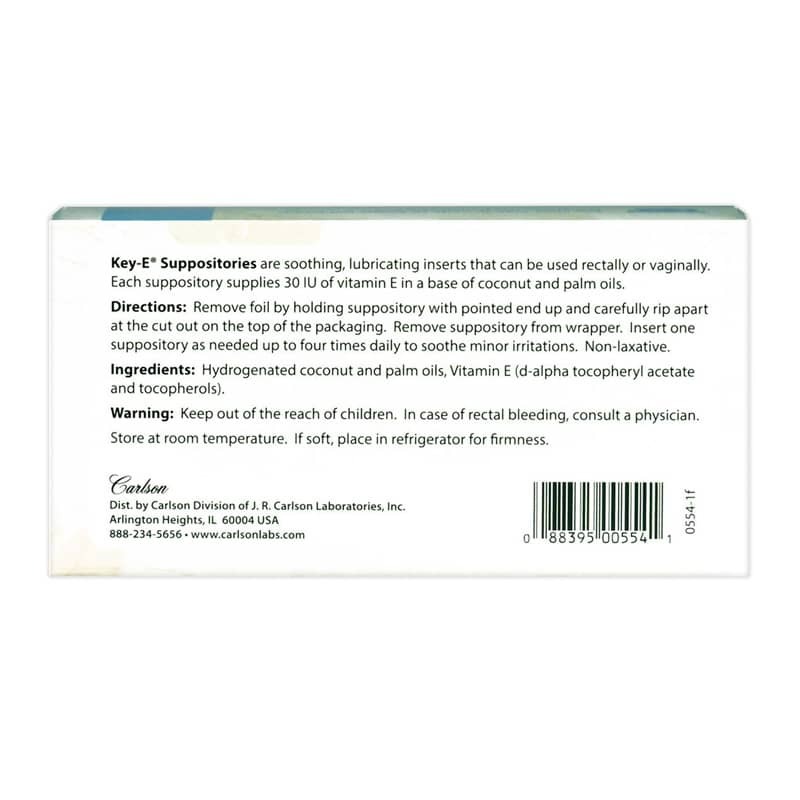 Key-E Suppositories from Carlson are natural soothing inserts prepared with a base derived from coconut and palm oils. Each suppository supplies 30 IU of Natural-Source Vitamin E.
Each suppository supplies 30 IU of Natural-Source Vitamin E.
Hydrogenated coconut and palm oils, natural-source vitamin E (d-alpha tocopherol acetate and tocopherols). Adults: Remove foil by holding suppository with pointed end up and carefully separating foil tabs at top with fingernail. Slowly pull apart by pulling tabs down on both sides. Remove suppository from wrapper. Insert one suppository as needed one or more times daily to soothe minor irritations. Non-laxative. In case of rectal bleeding, consult a physician. Keep out of the reach of children. Store at room temperature. If soft, place in refrigerator or firmness. Works very well, I am a very happy customer. They work well for vaginal dryness and itching. I like that they are natural and don't have any hormones in them. My doctor recommended a plant based product and this fits well. I only use 1-2 times a week with acceptable results so far!